It's A Dan's World: FALL IN POOZER: Kilowog Recruits You For Green Lantern: Rise Of The Manhunters! 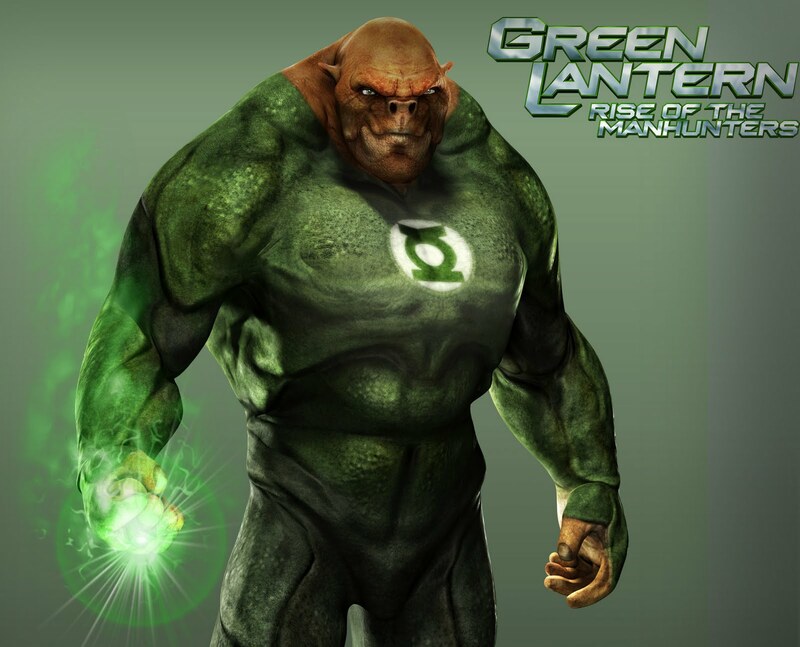 FALL IN POOZER: Kilowog Recruits You For Green Lantern: Rise Of The Manhunters! This generation has it easy. When I was a kid if I wanted to be Green Lantern, I'd have to wait until lunchtime to ignite a fictional hero playground war amongst my mates. While Luke Skywalker (piff) and Batman (groan) were quickly picked, newcomers and friends alike would have to pause while I a) explained who Green Lantern was, and b) after every move, so I could rationale what my ring had just generated and why I wasn't dead, but they were. Today's lot plug in the just released Green Lantern: Rise of the Manhunters and watch their friends go green with envy. Battle won. Well not quite. As a parent, friend or distant relation to said child, you're not going to let them hog all the Manhunter android bashing fun this little beastie contains are you? You've read the actual book - you have the inside track! Kick them outside to throw a ball around and by the time they click on to your Sinsetro-ish ruse, you'll already have the power ring/controller firmly in your grasp. 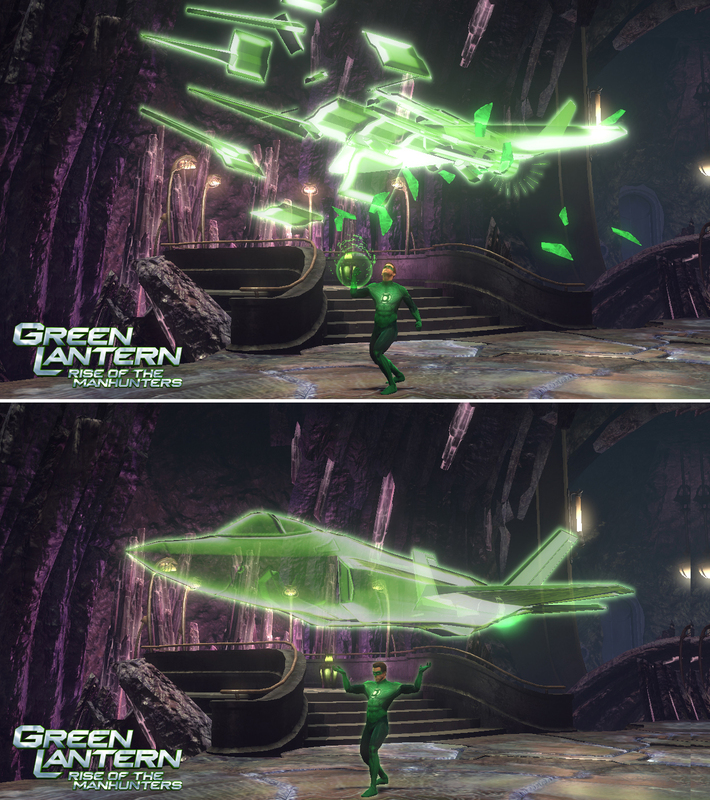 Intergalactic fun for the whole family- just look at these screenshots! They truly prove why Hal Jordan's imagination based arsenal has never really hit consoles before - imagine doing this on your Amiga 500! Available now on xBox 360, Wii, Nintendo DS, Nintendo 3DS and my personal pick of poison PS3, you can also carry on the movie tie in experience over on the Oa of all things internet, Facebook. 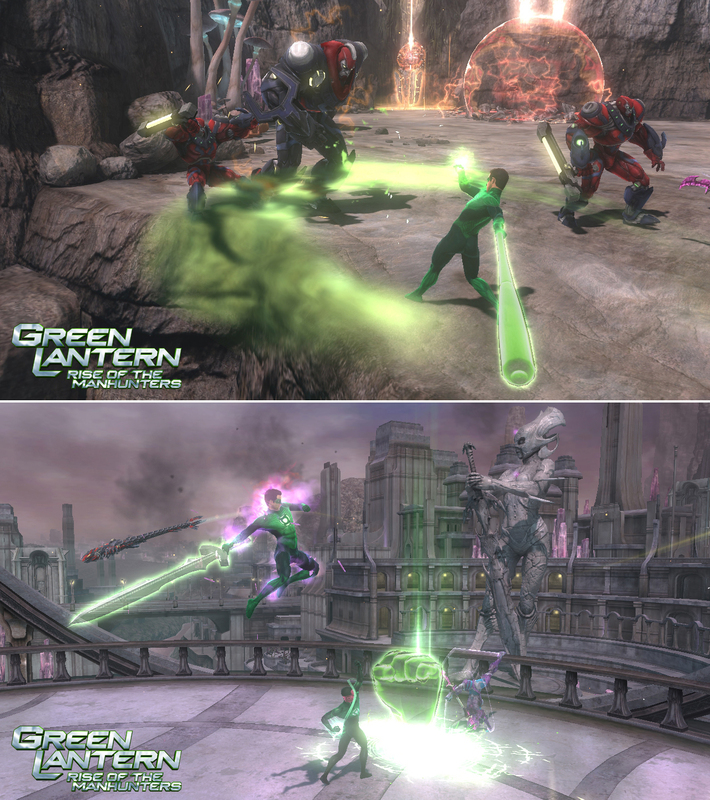 There on the Green Lantern: Rise of the Manhunters page, there are more exclusive screenshots and the ability to challenge your friends in an actual Power Ring battle. Lets see Batman or Skywalker do that! I was the little guy on recess (second shortest boy in class) so I always got stuck being C3PO. At home I got to be Boba Fett though. For costumed heroes, I know we played but for the life of me I can't remember who I ended up being. I think it was Spidey, but I'm not positive. Great post Dand. Way to bring me back to those days at the old school. "why I wasn't dead, but they were" LOL!!!!! Thank God for Wonder Woman's tv show, that made most of those girls, at least understand the concept of superheroines. I know the other girls didn't like. Thanks guys! Glad you too shared the high school hijinks! Hope you saw all the great GL: Rise of the Manhunters stuff to after recovering from laughing at my childhood obsession. Craig - I was always the tallest, so It's lucky I wasn't forced into being Chewie! Aliera - Adam West's Batman was on TV at the time I'm talking about so hence the Batman love. Kinda like what Wonder Woman would have done for your situation I think. I like the idea of creating your own there on the spot though - nice touch!